Leading up to Christmas, we're counting down each day with the best players to wear numbers 1-25 for the Yankees. The list includes Hall of Famers, recent stars, title-winning managers and fan favorites that have donned pinstripes over the last 115 years. Let's continue with No. 5, Joltin' Joe DiMaggio. The Yankee Clipper. Joltin' Joe. In a 13-year career broken up by military service, Joe DiMaggio made an indelible impact on the Yankees, shepherding two dynasties and becoming a pop culture icon in the process. The Yankees signed the California native in 1934 when he was just shy of 21 years old. He would spend one more year raking in the early days of the Pacific Coast League before heading to New York. Just one year removed from losing Babe Ruth, the Bombers needed a new star to shine next to Lou Gehrig in the Bronx. DiMaggio immediately served as that star. Taking over center field in 1936, DiMaggio proved himself from day one. He hit .323 with 44 doubles, 15 triples and 29 homers over 138 games, earning an All-Star appearance as he would in every season of his career. He held the home run record for a Yankees rookie until Aaron Judge's 52 long balls in 2017. He would then contribute three doubles among nine hits in the Yankees' six-game World Series win, starting off a run of four straight championships in the Bronx. In the next season, DiMaggio had one of the best seasons of his career despite clocking in at just 22 years old. He hit a career-high 46 home runs, knocked in 167 RBI and posted a .346/.412/.673 line that rivaled nearly anyone in the game. He finished second in MVP to Tigers Hall of Famer Charlie Gehringer, but the Yankee Clipper would homer in the clinching game of that year's World Series. The next three seasons were much of the same for the Yanks' center fielder. He earned his first MVP award in 1939 after batting .381 to lead the league. DiMaggio eclipsed 100 RBI in each of his first seven seasons and had at least 30 home runs in every year from 1937 to 1941. His power output was particularly impressive at the old Yankee Stadium, which featured a cavernous left-center field that prevented him from knocking the ball out of the park. 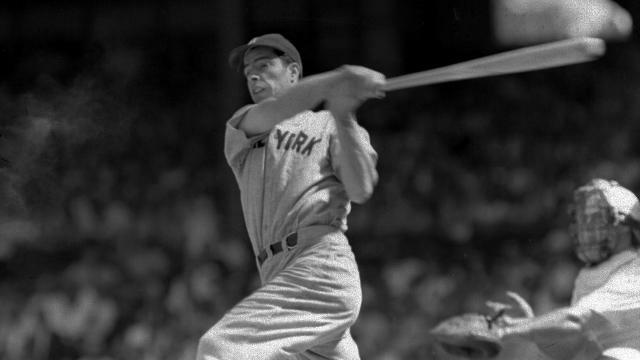 The defining year of DiMaggio's career came in 1941. Starting May 15 and running through July 17, DiMaggio hit in 56 consecutive games, breaking Wee Willy Keeler's MLB record and establishing a mark that many believe is unbreakable. After a strong 1942 season, he missed three seasons in the prime of his career for military service in World War II. He would return in 1946 and scarcely miss a beat, winning an MVP a year later and continuing to post consistently high averages. Furthermore, DiMaggio was known as an impressive glovesman in center field. The Yankee Clipper would win four more World Series after his military service, including three over his final three seasons. He played one year in the same outfield with Mickey Mantle, as his era of Yankees baseball bridged the gap between Ruth/Gehrig and The Mick. For his career, DiMaggio batted .325/.398/.579 with 361 home runs, the most all-time for a Yankees' right-handed hitter. His 131 triples and 1,537 RBI are both third-most in Yankees history. His eight home runs and 54 hits in World Series play are seventh and fourth all-time, respectively. DiMaggio was elected to the Hall of Fame in 1955. While DiMaggio was the face of the Yankees off the field, his shadow extended well past 161st and River Avenue. DiMaggio became a pop culture icon, particularly surrounding his relationship and marriage to Marilyn Monroe. Joltin' Joe is also famously mentioned in the Simon & Garfunkel song "Mrs. Robinson" among plenty other references within the culture at large.